Well, that was quick. 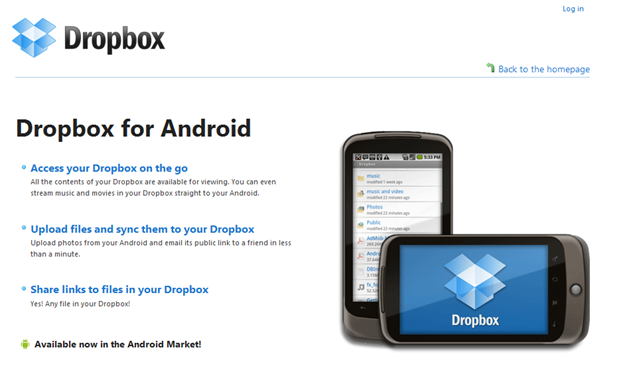 Dropbox announced today that the full version of their Dropbox client (v0.9.7) is available in the Android Market. My speculation is that additional features are planned for a full 1.0 release in the near future. Checking one of the failures from the beta, I checked the “Import Picture” option, and see that the photo albums are fixed. The option to import a video opens an album of only videos. This separation of photos and videos will make it much easier on users. The second beta bug that has been fixed is the Text File upload option now reports a friendlier error: “No applications can perform this action.” This helps to clarify that text file upload failure is not caused by the Dropbox client, but that my own device has no application installed capable of doing it for me. An additional feature added is in the Settings submenu: “Retry failed uploads” which will attempt a restart of any uploads that did not complete due to network failures. Bug fixes and features aside, the most important part of the announcement, of course, is the general availability of the client to the public. So what are you waiting for? Go grab it! Again, you can read our [p]review of the Dropbox application here.